Description: Our Sonic Glow POTs are 500K Linear Taper and have a real smooth feel to them. The POTs are the same size as a Standard Large Pot such as a CTS POT. The Sonic Glow POTs come in different colors. Please select a color from the drop down list. 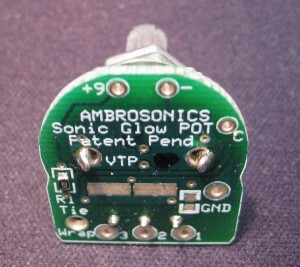 Click on the button for wiring instructions for 1, 2, 3 or 4 Sonic Glow POTs. 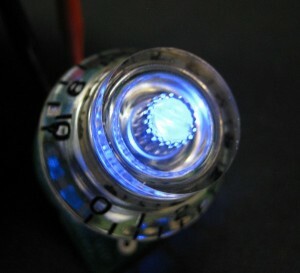 Description: This is a Blue Sonic Glow POT connected to 9 volt battery. 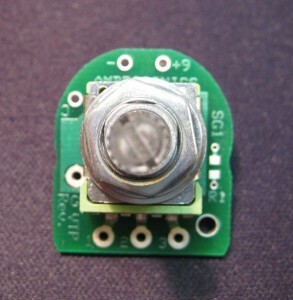 Description: This is the back side of a Passive Volume or Tone POT Board. Use a 9 Volt battery to power up the LED in the POT. Wire your POT terminals 1, 2 and 3 as you would for any replacement POT. 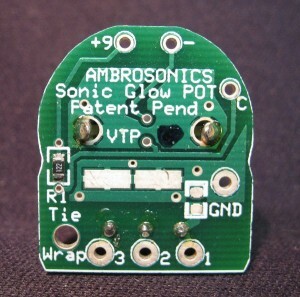 Finally, use a Tie Wrap to tie all 5 wires to the Sonic Glow POT’s PCB Board with the “Tie Wrap” hole provided! There is also a wire hole for GROUND as well as two surface rectangle areas to connect to GND like you would for any POT. 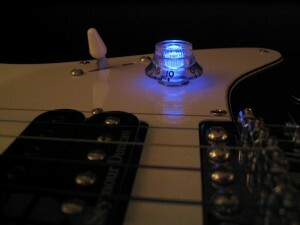 Description: This is the front of the Sonic Glow POT without our CLEAR Bell or Speed Knob attached. 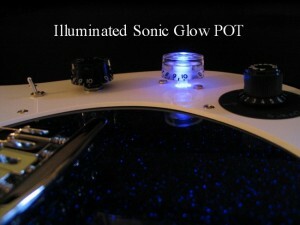 The Sonic Glow POTs can be used for Volume or Tone. Description: This is the back of the POT looking down on the full unit. It’s the same size as a Standard Large Pot such as a CTS POT.